Hiking and camping in Kamikochi is absolutely amazing! Let me tell you about the 3 days I spent in this wonderful place in the Japanese Alps… If you are into outdoor activities, I guarantee you’ll love Kamikochi as much as I do! You can buy a map of the Kamikochi area at the Tourism Information Center (see below for a small downloadable map). 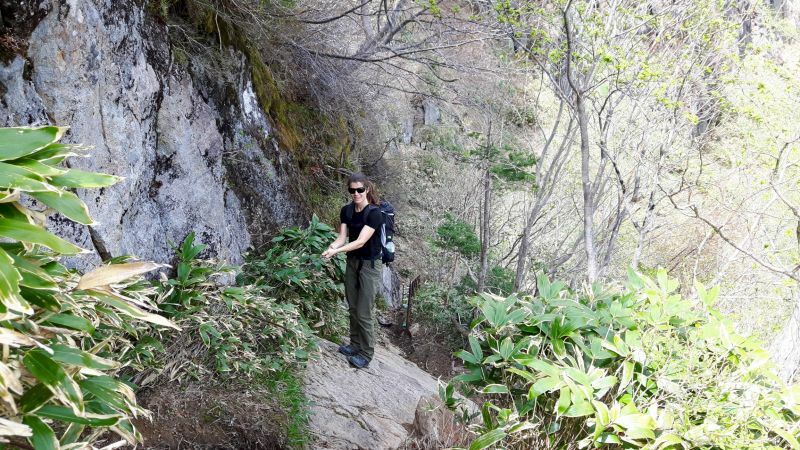 The friendly and helpful staff will also give you up to date information about the condition of the many hiking trails in the Kamikochi area. 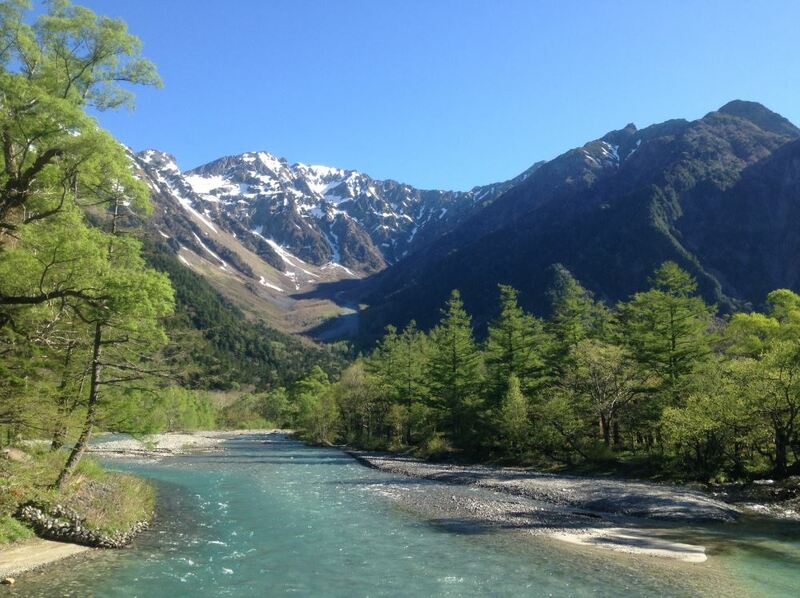 Kamikochi opens at the start of Golden Week in April until mid-November. We were therefore pretty early in season (mid-May) and many hikes were closed as they were still covered in snow. 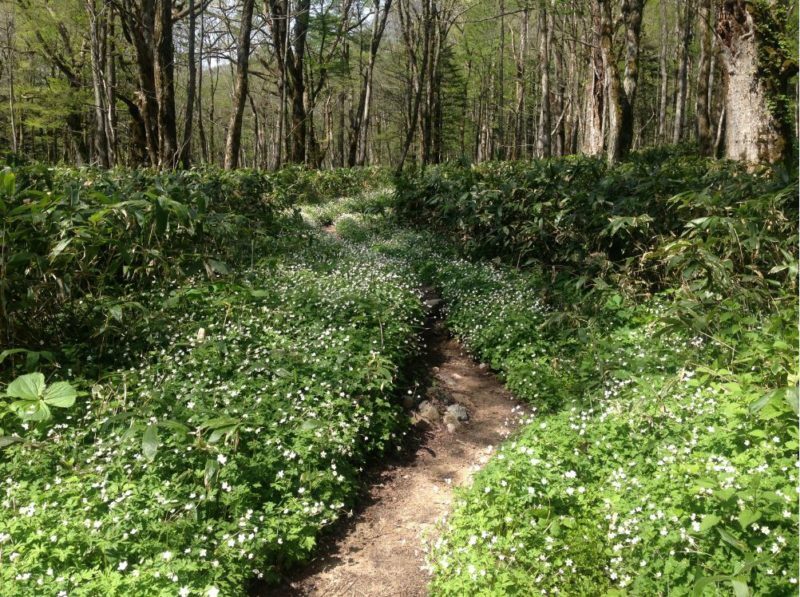 We were lucky that the Dakesawa hike was already open at the time of our visit. 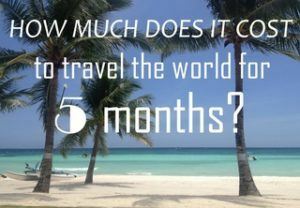 It varies from year to year, depending on the amount of snow and the weather. We started our hike around 9am from the famous Kappabashi bridge and hiked up to Dakesawa mountain hut (2216 meters above sea level) in about 2 hours. It’s a 700 meter ascend over a 4 kilometer long trail. The trail goes through the forest and past huge rock formations. There was still some snow on the trail, though not too much to make the hike difficult. The views kept getting better the higher we climbed and I couldn’t help taking picture after picture. We ended our hike at Dakesawa mountain hut, which marks the halfway point for the hike to Mount Oku-Hotaka Dake. That hike was still closed at the time of our visit and judging by the amount of snow up the mountain that was probably for the best. After a well-deserved break we hiked back down, our descend took about 1,5 hours. Don’t rush down as you’ll easily trip over the loose rocks. 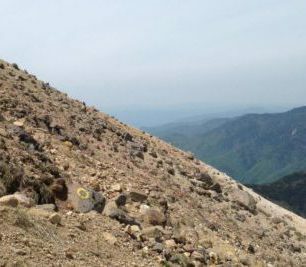 It’s safe to say the trail going up Mount Yakedake is the most adventurous trail I have hiked in my life… The trail involves many ladders, ropes and chains to help you climb the steep track. It’s a 5 kilometer trail up the mountain, ascending took us 2,5 hours. 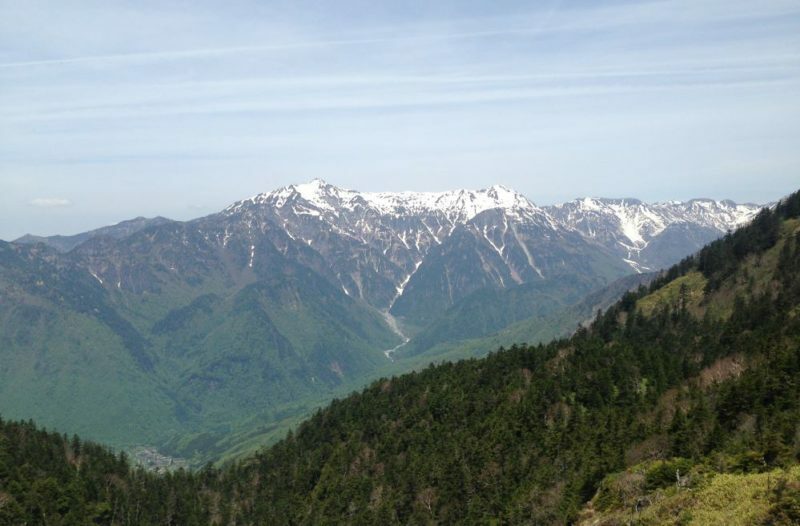 Yakedake means ‘Burnt Mountain’ in Japanese and it’s one of the 100 famous Japanese mountains. The final part of the hike strongly reminded me of climbing Mount Ngauruhoe (a.k.a. Mount Doom) in New Zealand because of the pungent sulfur smells and unforgiving angle of ascension. We climbed through snow and over slippery rocks but finally made it to the 2455 meter high top, 900 meters of climbing, ouch! But the views, phenomenal… We were all alone at the mountain top, one of the best places I ever had lunch! After resting for a while we hiked back down, it took us 2 hours and 15 minutes. Walking over the loose rocks and climbing down the ladders is not something to be rushed! We were very tired after hiking Mount Yakedake, luckily we could rest and relax our tired muscles in the steaming onsen at our campsite. We stayed at Konashi-daira campsite for 3 nights. From Kamikochi bus station it’s only a 20 minute walk to the campsite. This campsite was the best of the 4 campsites we stayed at during our one month trip around Japan. • Price paid per night: ¥1600/€13/$14,50. • Click here to see the campsite website. Kamikochi is known for being rather expensive, the resort are very luxurious and prices start at ¥8400/€67/$76 per night (see the Kamikochi accommodation website, Agoda or Booking). 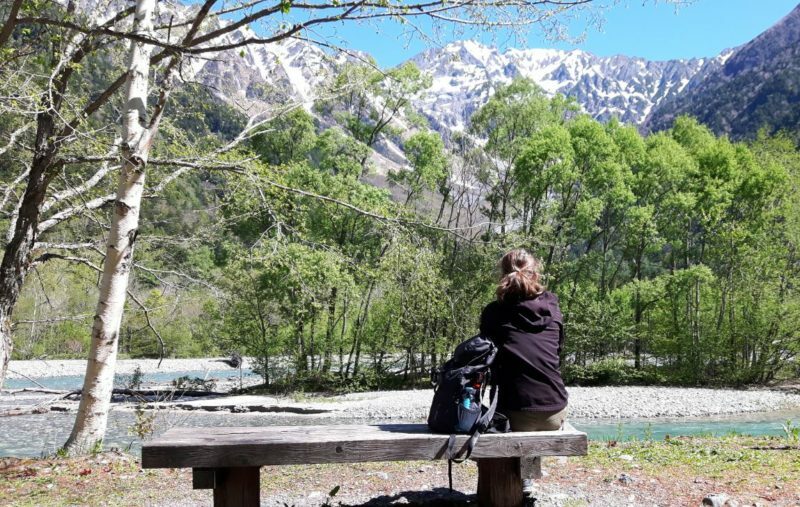 However, you can absolutely visit Kamikochi on a budget! Camping was only ¥1600/€13/$14,50 per night for the two of us. 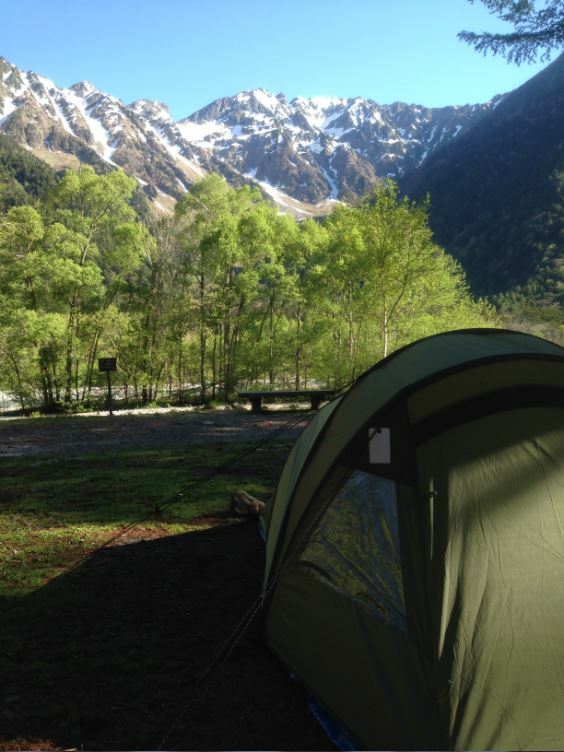 • I spent 3 days and 3 nights in Kamikochi and traveled with my husband. You can find our camping packing list here. 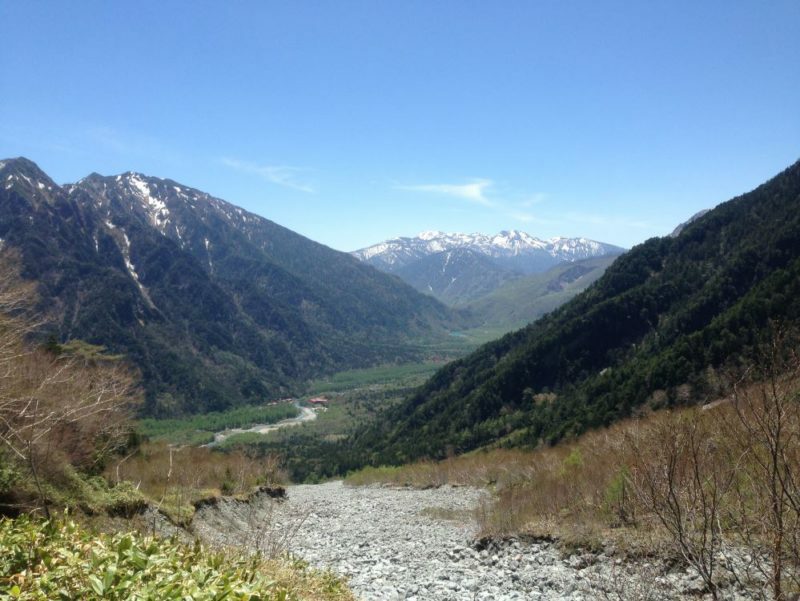 • I included the costs to travel from Takayama to Kamikochi and to travel from Kamikochi to Matsumoto. • Our trip to Japan was in April/May 2016. The exchange rate around that time was approximately €1 = 125JPY (¥) and $1 = 110JPY (¥). 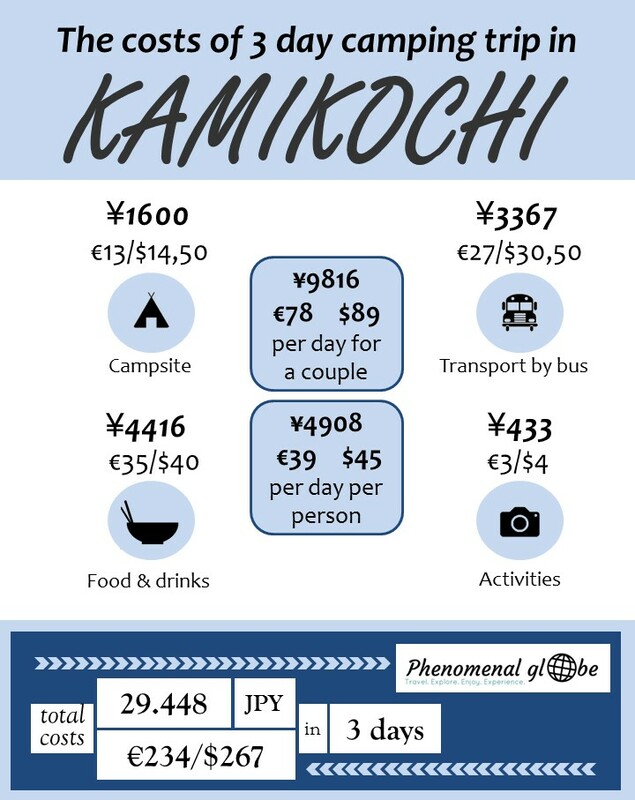 • In total we spent ¥29.448/€234/$267 in the 3 days we were in Kamikochi, this comes down to an average of ¥9816/€78/$89 per day for us as a couple. • Be sure to take enough cash with you, there is no ATM in Kamikochi. From Takayama we traveled to Hirayu Onsen by bus, at Hirayu Onsen we changed to another bus taking us to Kamikochi. More information can be found here. We booked our bus ticket at the bus station in Takayama, only a couple of hours before our departure. The price for a ticket is ¥2600 (€21/$24) per person. It’s easy to travel from Kamikochi to Matsumoto, public transport in Japan is so well organized! From Kamikochi bus station we took a bus to Shinshimashima train station where we changed to a tiny train taking us to Matsumoto. More information can be found here. We booked the combined bus-train ticket a day before our departure, you can do so at Kamikochi bus station. The price for a ticket is ¥2450 (€20/$22) per person. We didn’t know if food would be available at Kamikochi, there isn’t much information available online (in English at least?). So we bought some food in Takayama (bread, butter, bananas, some snacks to eat on the hikes and a 1 liter water bottle each, you can refill these, tap water is drinkable in Japan) before traveling to Kamikochi. It turned out it wasn’t necessary to bring food with us because there is an awesome restaurant at Konashi-daira campsite serving delicious food for very reasonable prices (¥600-¥1200). The campsite restaurant is open between 7am – 1:40pm for breakfast and lunch and between 4pm – 5:20pm for dinner. Yes, I agree that’s pretty early for dinner. In conclusion, don’t skip Kamikochi when you are in Japan! 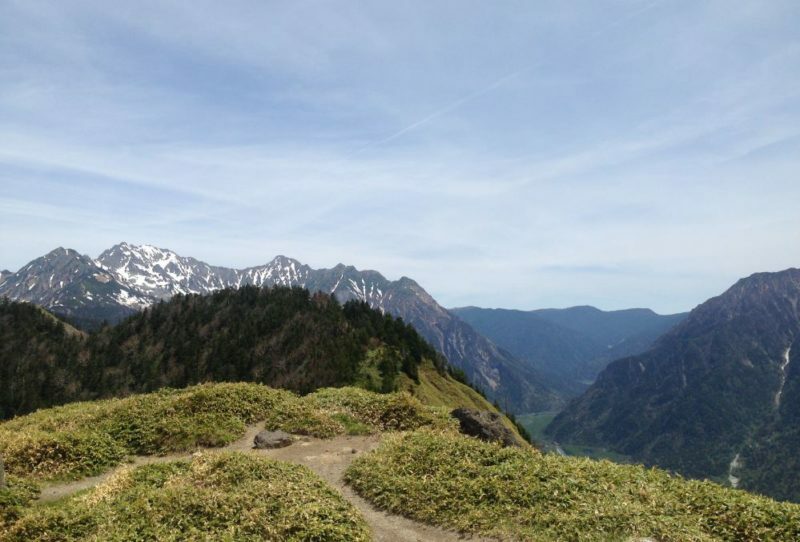 It’s a different side of versatile Japan, a place to disconnect, to enjoy nature and spend your days hiking and marveling at the magnificent scenery. 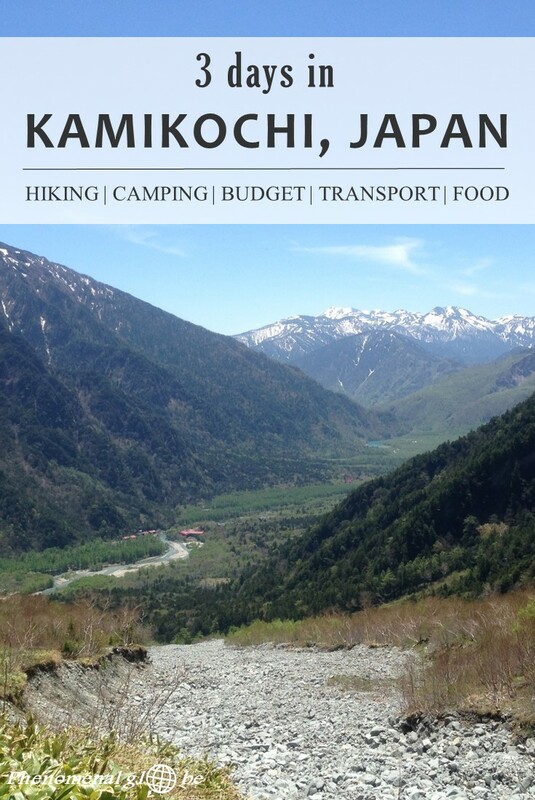 You can download the budget breakdown and a map of Kamikochi below. Please buy a map at the Tourist Information upon arrival, this one is just to give you an idea of the layout of Kamikochi. 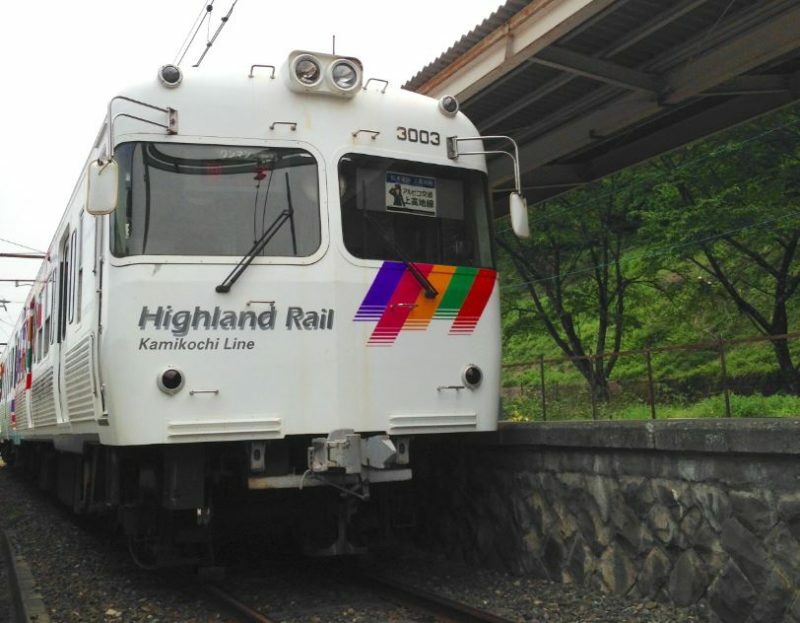 Check my Japan page if you want to read more about travel in this great country! Gorgeous, would love to visit this part of Japan one day! Did you see many other visitors here? It’s really beautiful indeed! There were other visitors but mainly from Japan itself. 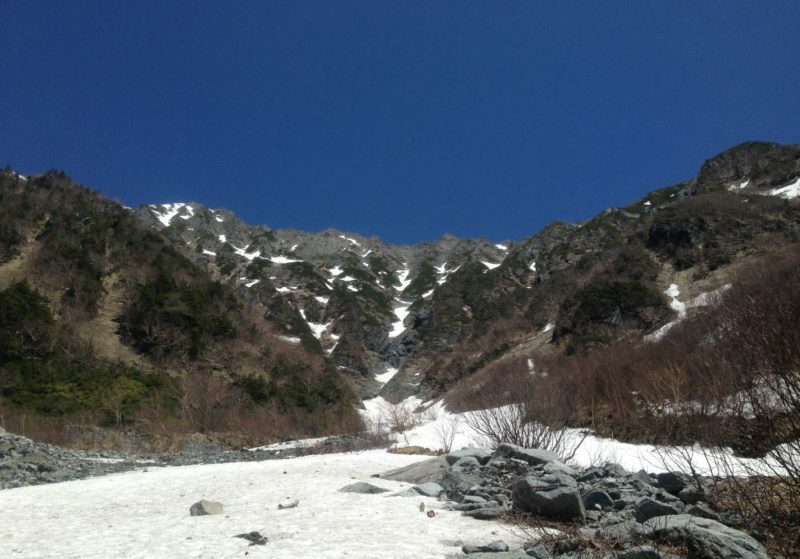 But we were in Kamikochi in low-season, I imagine it can be quite busy during summer. 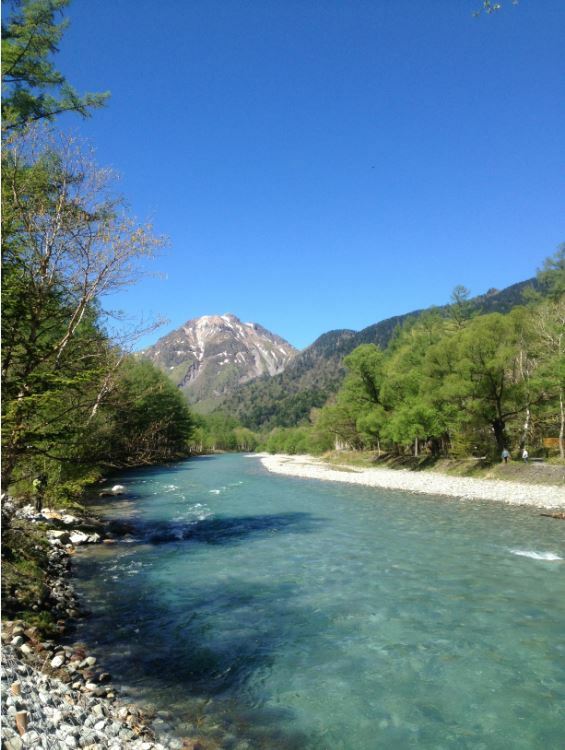 Kamikochi is always a good place for camping and hiking. Last month, my beloved daughter and I went there. The first day there was awesome. We spent 2 days together building up our bond, enjoyed the fresh air in the morning and had bbq in the afternoon also. Thank you for sharing and please keep it up. Wow, Lotte, there are such wonderful views at Kamikochi! 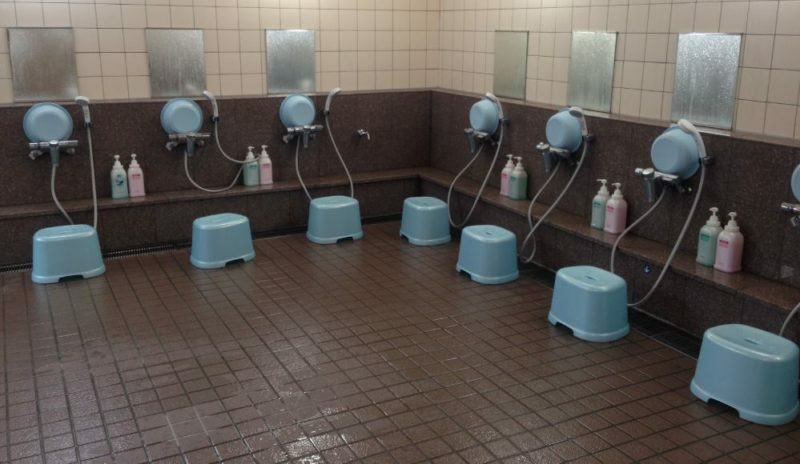 I`ve always wished to visit Japan someday and now I know exactly where I want to go! Thanks so much for the info about the budget! Thanks, happy to hear you like the Kamikochi pictures and budget information. It’s such a beautiful place, enjoy your time there!